Today the Church celebrates the memorial of St. Josaphat, a Catholic of the Ruthenian rite. Born in the then Polish region of Lithuania of Orthodox parents, he became a Catholic and a Ukrainian Basilian monk. Chosen bishop, he worked faithfully for the unity of the Church until he suffered martyrdom at the hands of an angry mob in Russia. His feastday in the Extraordinary Rite is celebrated on November 14. According to the 1962 Missal of St. John XXIII the Extraordinary Form of the Roman Rite, today is the feast of St. Martin I who was pope from 649 to 654. He was a courageous defender of the faith against heresy. He held a council at Rome which condemned the Monothelite heresy which taught that Christ had no human but only a divine will. The heretical emperor, Constans II, had him treacherously arrested and taken to Constantinople. After many sufferings and humiliations, he was exiled to Cherson in the Crimea where he died of exhaustion in 654. Josaphat Kuncewitcz was born about the year 1580 at Vladimir, Volhynia, [part of the Polish province of Lithuania at the time] and given the name John at baptism. While being instructed as a child on the sufferings of our Savior, his heart is said to have been wounded by an arrow from the sacred side of the Crucified. In 1604 he joined the Ukrainian Order of Saint Basil (Basilians), lived as a monk in a very mortified life, went barefoot even in winter, refrained from the use of wine and flesh-meat, and always wore a penitential garb. In 1614 he was appointed archimandrite of Vilna, Russia and four years later archbishop of Polotzk; in this position he worked untiringly for Church reunion. He was a great friend of the poor, once even pledged his archepiscopal omophorion (pallium) to support a poor widow. The foes of union decided to assassinate him. In a sermon, he himself spoke of his death as imminent. When he visited Vitebsk (now in Russia), his enemies attacked his lodging and murdered a number of his companions. Meekly the man of God hastened toward the mob and, full of love, cried, "My children, what are you doing? If you have something against me, see, here I am." With furious cries of "Kill the papist! ", they rushed upon him with gun and sword. Josaphat's body was thrown into the river but emerged, surrounded by rays of light, and was recovered. His murderers, when sentenced to death, repented their crime and became Catholics. Pray to St. Josaphat for the reunion of the separated Eastern Churches. Read Pope John Paul II's Apostolic Letter on the Eastern Churches, Orientale Lumen. Read Pius XI's Encyclical Ecclesiam Dei on St. Josaphat and Pius XII's encyclical Orientales Omnes Ecclesias (On The Reunion Of The Ruthenian Chuch With Rome) . Learn more about the different Eastern Rites which are in union with the Pope. 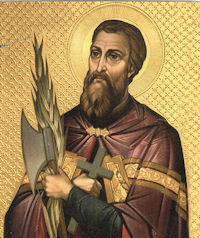 Josaphat is the patron saint of Ukraine, but his life has Russian, Polish and Lithuanian influences. The recipes section has several highlighted recipes from these different regions. Pope Martin I (649-654) was outstanding for virtue and knowledge. He was selected by divine Providence to be the supreme defender of the doctrine that in Christ there are two wills, a divine and a human, against the monothelite teaching of one will, favored at Constantinople. Immediately after ascending the papal throne, he convoked a synod at the Lateran which put the true teaching in its proper light and condemned the opposing error. Emperor Constans II supported the monothelite patriarch of Constantinople and commissioned the Exarch Olympios to assassinate the Pope. The Exarch entrusted the task to a lictor to murder Martin during Mass in the church of St. Mary of the Crib. The lictor could not accomplish the mission because he was suddenly struck blind. From that moment many misfortunes befell the Emperor, but no change in attitude resulted. Instead he sent the Exarch Theodor Kalliopes to Rome with orders to arrest the Pope. Martin was carried to Constantinople to begin a tedious martrydom. He was given over to the scoffing of the rabble as he lay ill on the ship. For three months he languished in prison. Called before a tribunal, he was condemned, robbed of his episcopal garments and put into chains. Finally he was banished to Kherson in the Crimea and died there due to inhuman privations. Two letters written before his death give evidence of how he suffered under the dreadful treatment. Often Portrayed As: Pope holding money; pope with geese around him; pope in a prison cell. Things to Do: Learn more about the monothelite heresy.